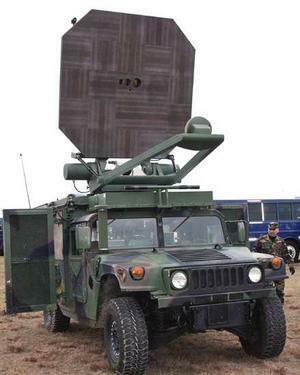 Raytheon's Active Denial System, a nonlethal microwave energy weapon system, is finally emerging from the shadows. It's not expected to go into production until 2010, but at least the military is providing real pictures (see below) rather than computer graphic representations (see the previous story Active Denial Technology: Directed Energy Weapons). During a media demonstration of the weapon on January 24th of this year, USAF airmen fired beams from a large dish antenna mounted atop a Humvee. The "rioters" were troops providing a realistic simulation of activities that might be found in war zones. The two-man crew fired beams at people 500 meters away; this is more than fifteen times the distance at which other non-lethal weapons are usable. Everyone hit by the beam immediately jumped out of its path because of the sudden blast of heat throughout their bodies. Wade Smith, deputy director of this program for Raytheon, has voluntarily felt the beam during testing. "This is an effect that literally gets under your skin," said Smith, "I can assure you, once you come in contact with the beam, you will be inclined to stop whatever you are doing." Slowly a humped shape rose out of the pit, and the ghost of a beam of light seemed to flicker out from it. Other nonlethal weapons are currently in development. Read about the Piezer, the Long Range Stunners and the Inertial Capacitive Incapacitor. See also Active Denial System Has Researchers Worried for more information. Thanks to an anonymous reader who provided the tip; read more here as well as many other places.